Fall is calling. I can hear it in the breeze. I can smell it in the rain, taste it in the new fall apples, see it in the reddening leaves. I can feel it in the cold night air pouring through the open window as I cuddle warm under the blankets with my beloved. It is raining after weeks of glorious sun. 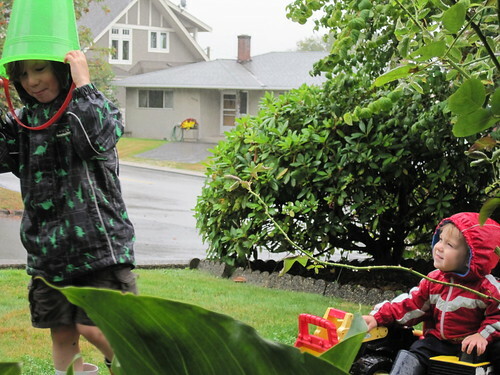 Boys grab rain jackets and go outside to play. I sit at the open window, taking pictures and breathing in the smell of my warm jasmine tea and the cool fresh air. The boy's new boots are bright blurs as he runs around the yard, head back and mouth wide open to catch the falling rain. 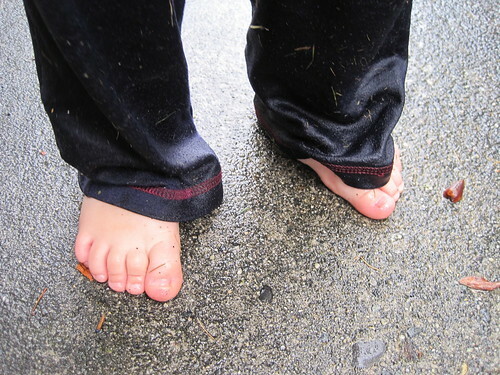 The little one wears cast-offs from his big brother, too big, soon left somewhere in the grass as he runs and falls and crawls in pink bare feet. Fall is calling. My thoughts turn towards apple picking and fall baking, pumpkin pies and hay rides. Thanksgiving plans fall into place. Books pile high on couches, boy-turning-reader who still wants to hear them in his mother's voice. Stews and soups are set on the dinner table beside warm biscuits. The bright greens and blues of summer are replaced with yellow and orange, red and brown. I begin to knit a sweater. Fall is calling, and I have come to love it. beautiful <3 This is such a beautiful time of the year. I didn't know you used to dislike fall... we have this in common (only I've not been cured yet :) My only tactic is to live life to the fullest during summer, then I'm not so bitter that it's over. Excuse me, I think I need to go to the store...I just figured out what dinner is tonight! Another Fall lover here. And so many posts about it around the blogs today - I'm getting excited myself now. I thought Summer was way too short and was kind of bummed about the rain but today is so sunny and beautiful, and the air is SO fresh. Loving it! Bess, that stuffed squash sounds amazing! This is the recipe I start with. I don't like cinnamon, so I use nutmeg instead. I've also made it with chopped and frozen squash that I thawed out and just made a "jumble" with the same ingredients...I think I liked that even better! Also, I wanted to mention that your little bitty's toes just melted my heart. Love it. You're one up on me - aside from pumpkin pie and tea I *hate* the colder seasons. I can barely make it through to spring without becoming seriously depressed, but I'm trying to fight it this year by decorating and embracing its prettier side. Thanks so much for the recipe, Bess! I'll definitely be trying that soon. Lindsey, that was me a few years ago too. It took a lot to find the beauty in fall, the peaceful rhythm of leaving behind the excitement of summer and preparing to settle in for the quieter winter. Winter still gets the best of me, but I'm hoping that someday I will come to appreciate it as well. I hope that you, too, have a better fall and winter this year. It's a tough couple of seasons without the warmth of the sun. This is great. I love fall SO much. I am not fond of the weather here, and I'm so looking forward to the climate in the UK. I want to wear sweaters, boots and have a need for a proper rain coat. I'm so excited!